This fringed white leather jacket is sublimely 80’s and just the thing to wear to a rock concert. The fur hat – also a necessity in these winter winds. Winter has been especially long and cold this year with only a few days of seasonal respite to remind us that living in the northern hemisphere is just plain silly. 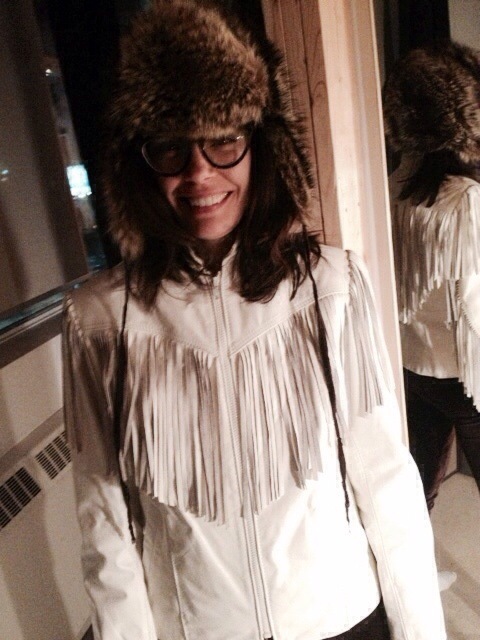 Now that we’ve got that down it can only mean this: a white fringed leather jacket scooped up from the Queen Street West shop where it was made 30 years ago. Note the fringe on the front and back. Yes it really is that awesome as it angles down and across on angles that could have only been fair game in eras that didn’t listen to what was right or wrong. Vintage love 4ever. But don’t get ahead of yourself. Sweater underneath (layers! The rules of warmth as per MEC still count on a solid fashion evening- when you live in Canada, that is). Pair that with a lynx fur hat and you’re toasty. And hot damn you’re looking right on the Money. Image by Fashion in Motion. We need to see an action shot in this jacket – spin around fast!